Gorgeous and very lucky little pink and turquoise blue dress for sale. Would best suit a 6-8 year old dependent on size. Available in August. Worn by a very petite under 8 dancer. Kept in a smoke and pet free home. The dress is made of bright pink velvet, adorned with 100s of Swarovski Crystals and beads. The Dress is a modern 5 panel dress, with white and pink polka dot frills in between the pleats, with matching frill on the cuffs. Very light this dress has the ‘wow’ factor, its adorably cute! 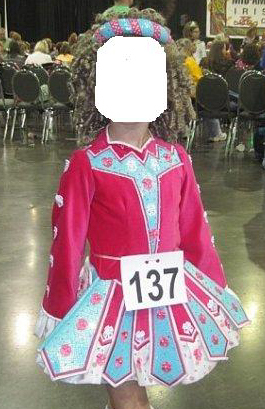 And has been very lucky for the little dancer who wore it. Dress comes complete with matching kick pants and headband. Asking Price: $US400. Shipping costs not included. Returns are negotiable.